ABOARD A US MILITARY PLANE (AP) — US President Donald Trump’s administration on Monday urged Europe to impose tough new sanctions on Iran over its ballistic missile program. The call came as Secretary of State Mike Pompeo was to meet Prime Minister Benjamin Netanyahu and European officials in Brussels this week and after the US and others condemned an Iranian missile launch over the weekend. Iran is expected to be a major topic of conversation when Pompeo meets Netanyahu in Brussels on Monday night. Pompeo also plans to talk about Iran when he meets his counterparts from Britain, France, and Germany, on Tuesday, while he is in Belgium for a meeting of NATO counterparts. 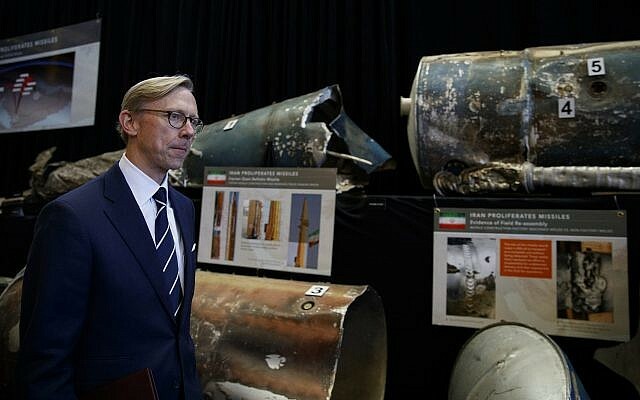 US special envoy for Iran Brian Hook rejected Iran’s insistence that its missile program is defensive. 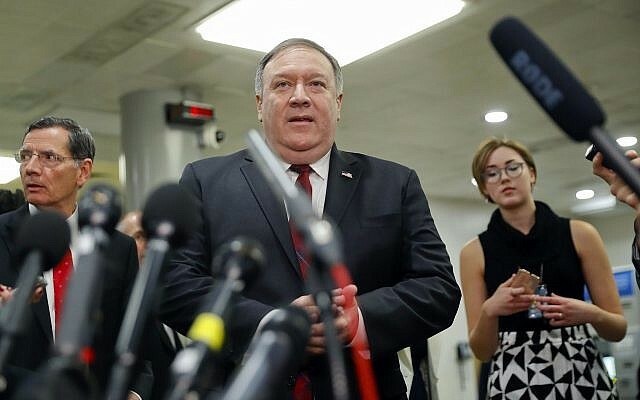 He told reporters traveling with Pompeo that Iran’s continued missile development and testing is a threat to the region and beyond and in defiance of UN Security Council demands. Hook said US discussions with the Europeans about missile sanctions are gaining traction. Those talks center on slapping penalties on companies and people involved in Iran’s program. Hook’s comments on Monday were the latest salvo in an escalating US campaign against Iran since Trump pulled out of the 2015 nuclear deal in May. On Thursday, Hook accused Iran of violating a UN ban on Iranian arms exports by sending weapons to its proxies in Afghanistan, Iraq, Lebanon, Syria, and Yemen.